The Effects of Charge Air Cooling on the Turbocharged Engine(s). Most pilots subscribe to the adage, "Fuel is cheaper than engines". Certainly, using more fuel to cool the engine is cheaper than burning a piston or a valve due to a hot lean mixture. Of course, lean mixtures can lead to detonation which exists when the super-hot compressed fuel/air mixture prematurely explodes, instead of burning with a smooth flame front across the piston dome. Adding more fuel to the mixture can discourage the tendency to detonate. Another, more effective, method to prevent detonation is to provide cool compressed air to the mixture. Cool compressed air provides the same effect on detonation protection as a rich fuel mixture, and provides an extra margin of engine operational safety. It is typical of modern aircraft engines and the trends shown are substantiated by independent technical information previously published by the Society of Automotive Engineers. Cool charge air can allow an engine to be operated at best economy fuel flows, with equal or better detonation margins as when operating with hot charge air, richer mixtures and much higher fuel consumption. By simply cooling the charge air temperature to 100°F, and keeping all other parameters constant, the maximum allowable I.M.E.P. 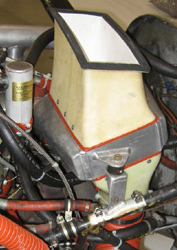 increased to 210 PSI, a 40% improvement in allowable pressure for the same fuel mixture. With intercooling, the pilot can run leaner mixtures and still obtain equal to or better detonation margins.. Now back to the old adage, "Fuel is cheaper than engines." With intercooled engines, even conservative leaning can result in 2 gph per engine. With the high price of fuel, you could save up to $7,000 for single and $14,000 for twin engine over a 1600 hr. TBO. The point here is that fuel isn’t exactly cheap either. If you can reduce fuel consumption and maintain good detonation margins with a quality intercooling system it’s certainly worth considering. Recently, Mr. Peter Garrison of Flying Magazine investigated, and stated, "Fuel is expensive, but turbochargers and cylinders are too; I feel that the best way to go easy on an engine is to operate at moderate power settings.. Intercooling makes it easier to do this, and so my inclination is to regard any well designed intercooling system as a benefit." Regarding the effects of hot and cold induction air and engine life, he said, "To the extent that you can harm your engine, you’re much more likely to do it with heat than with cold". He further explains that "with efficient intercooling, you can use mixture settings closer to peak or even at peak and get much lower fuel flows, so long as turbocharger inlet temperatures stay below limits (normally 1650°F) and cylinder head temperatures are below 400°F. An intercooler is often used to reduce the heat turbochargers produce and promote more efficient combustion. Particularly with an aftermarket intercooler, it is often necessary to adjust manifold pressure down from original specifications, to compensate for the cooler compressed air entering the engine. This is important to keep in mind as (without the adjustment) it’s easy to miscalculate power and fly at a higher percentage of power than is realized if flying according to the original factory data. Reducing MP to accommodate intercooler impact will help preserve engine longevity. Our turbo-chargers are just small air compressors. Their sole job is to send compressed air to the engine; that's how we maintain (or increase) power at altitude. There are other engine components that control turbo charger output, but the turbo just pumps air. It's that simple. One problem that we face in turbo-charged aircraft is the temperature of the compressed air. Anytime air is compressed the temperature is increased. For our piston engines, this produces problems. Increased induction air temperature increases cylinder head temps and can lead to detonation, which can cause catastrophic failure of the engine. Hotter air also results in less efficiency. Hotter air is less dense, meaning that there are fewer air molecules entering the cylinders for combustion, which decreases the volumetric efficiency of the air. This works against the efforts of the turbo-charger. There are a few ways to deal with the problem of increased air temperature. Some are better than others. The most simplistic option is to decrease the performance of the turbo-charger, i.e. not compress as much air. Certainly, this isn’t the best option, we want to cram as much air into the cylinders that we possibly can, after all, it's all about speed & power, right? 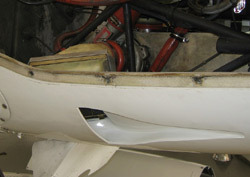 Another option might be to increase the fuel flow into the cylinders. Now this fuel isn’t being burned, as it is atomized it absorbs heat and carries it out the exhaust valve, thus providing a cooling function. This isn’t a great solution because it increases fuel burn and emissions. 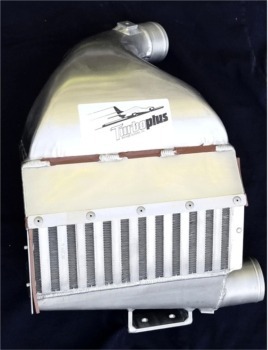 Today, the major players in aircraft engines such as TCM and Tornado Alley Turbo use intercoolers to help offset the increased induction air temperature, but it's important to note that the compressed air is still warmer than it was before entering the turbo-charger. An intercooler is simply a heat exchanger. In a heat exchanger, a transfer of heat (energy) takes place. Hot, compressed air exiting the turbo then flows through the intercooler where heat is transferred to the tubes & fins of the intercooler. Ambient air then flows over & through the fins of the intercooler and absorbs the heat from the intercooler and sends it overboard. The amount that the intercooler cools compressed air depends on many things. First, the design of the intercooler comes into play. What is the size of the intercoolers surface area? How many tubes? Fins? Second, where is the intercooler installed? Can a large amount of air flow over the intercooler with ease? Aircraft speed also plays a part. Fast cruises at low angles of attack provide more cooling airflow then low airspeeds and high angles of attack. As you can imagine, ambient air temperature plays a huge role in determining the effectiveness of an intercooler. Simply put, the greater the difference in the compressed air temperature and the ambient temperature, the easier it is for the intercooler to transfer heat.